Well, traditional HR that is…..Let’s face it, companies with the best talent win. So the most important task for any company, especially small business, should be to attract, hire and develop talent. So how do we maintain the administrative and legal requirements within traditional HR management, while at the same time cultivate team member commitment for sustained customer loyalty and business growth? Looking at this and some of my previous posts, it might appear that I am in Human Resources, but that’s not the case. Certainly, as a consultant and business owner you have to develop a fairly high level of expertise in this area, but my core is in Operations. From my experience I have found that the best way to grow a business, especially small business, is through its people. To further that effort I have had to overhaul several misguided HR departments in my career, because they were guilty of building traditional HR empires that, among other sins, barricaded talent. Instead, I am all about building business, especially small business, and again, experience has taught me that talent builds business—not education, not strategy, and definitely not traditional HR approaches. The traditional HR approach is often perceived as the department that passively recruits and hires workers for open positions within a company or corporation. Thereafter, they manage the mound of administrative paperwork and duties generated by the hiring of said worker, which have been established and upheld with employment law and business ethics as the ruling doctrine. This direction is actually not surprising when you consider the wave of government labor regulations heaped on companies and corporations in the past two + generations. As a result, HR departments (and small business owners) have become proponents of what not to do to avoid government/legal action. This limits their ability to focus on practices that attract and develop winning talent to grow their business. This is how traditional HR becomes the enemy of commitment, customer loyalty and profitability! Conversely, Strategic HR Management (SHRM) is an active process with an ROI! It takes a leadership avenue geared toward developing strategic approaches that align with company climate & culture, integrate into organizational plans, and develop team members to drive the company’s purpose & profitability. As a result, company procedures for talent development and growth are designed with organizational direction in mind, while government and legal matters are administrative considerations (best addressed through outsourcing). While I have enjoyed working with large corporations, my heart and soul is forever connected to small business and small business owners. 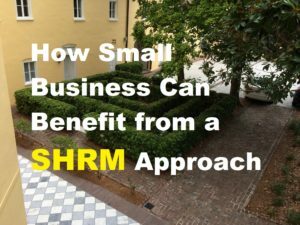 So if you own a small business, whether a franchise or independent operation I urge you to incorporate SHRM practices to facilitate the integration of talent, climate & culture, and genuine commitment & engagement for the long term success of your business. A Purpose Driven Integrated System that has your company’s Purpose as the Flywheel, to drive your Integrated System for transformation, success and sustainable growth. A Climate that provides growth and involvement, as defined and advocated by your team members. A Culture that fosters engagement and commitment to drive your core purpose, and is committed to continuous improvement. An HR process that strategically integrates both a foundation for admin & legal protection, and especially a launching pad for talent growth and sustainability. I welcome your comments of both good and bad examples of Talent Recognition, SHRM, and Traditional HR. And as always, if you enjoyed this post, please share it!